AGERPRES, Romania’s national news agency, in partnership with the Embassy of Romania in the UK and the Romanian Cultural Institute, are putting together an event dedicated to 100 years of modern Romania. 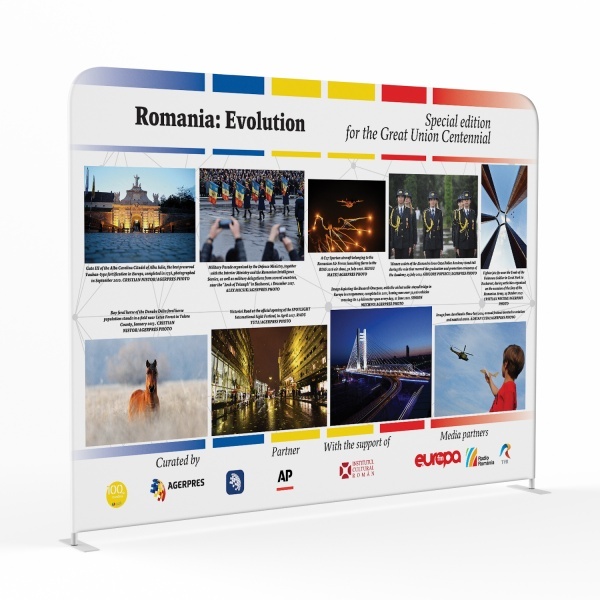 Join us for the private view of the “Romania: Evolution” photo exhibition and the screening of the “Great Union – Romania at 100 years” documentary film. Introductory remarks by Mihaela Cristina Tatu, Deputy General Manager of AGERPRES and HE Dan Mihalache, the Ambassador of Romania at the Court of St James’s. The “Romania: Evolution” exhibition presents, in a most attractive visual manner, images from the archives of AGERPRES captured by the agency’s photo reporters, which best illustrate Romania’s evolution, along with images form the archives of Associated Press, depicting crucial personalities for our country’s evolution: King Ferdinand and Queen Marie of Romania, renowned author Eugen Ionescu, Romania’s greatest composer, George Enescu, acclaimed singer Maria Tănase, Romania’s Edith Piaf, or the legend of gymnastics, Nadia Comăneci. 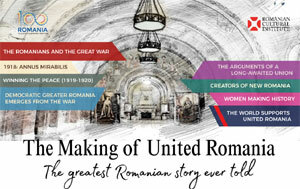 The “Great Union – Romania at 100 years” documentary is an invitation to an emotional and captivating voyage, lived by people who actually made the greatest Romanian story ever told a reality. AGERPRES decided to follow the trail of Romania’s greatest political personalities and interview their successors in Bessarabia, Northern Bukovina and Transylvania. Through their voices we discover that we are a borderless nation as our country, at 100 years, is still writing its history. An AGERPRES production by Mihuţ Năstăsache, Marilena Stănescu and Sergiu Olteanu. Image: Alfred Schupler, Sergiu Olteanu and Andrei Cârlan. Reporters: Marilena Stănescu, Mihuţ Năstăsache and Camelia Moise. Design, sound and editing: Andrei Cârlan and Alexandru Vintilescu.